So, three Ethiopians on the podium, and the first time in many years that a Kenyan has not won, let alone not even finished on the podium. Kebede was the class act of the day, and was its aggressor. He went to the front shortly after halfway, while the pacemakers were still there, and you could see him straining to go. Once they dropped off, Kebede had free reign and open road, and he took both, going to the front and winding the pace up. Halfway was reached in a relatively slow 62:53 (the talk was of a 62-min target), but then Kebede cranked it up. From 25km he ran a 14:29 split, and followed that up with a 14:19 split to take him to 35km. That meant he covered those 10km in 28:48, and it was enough to destroy the field, with one exception – Lilesa. The Ethiopian was the last man standing with Kebede, and so with 5km to go, the race resembled the epic 2010 battle that saw Kebede and Wanjiru duel together in a race that resembled a track cycling race, such were the surges and counter-surges. On that occasion, the two were locked together until the last straight, and Wanjiru broke Kebede for the win. That didn’t happen today – Kebede was too strong. Lilesa showed at the front for a while, but with about 4km to go, he dropped behind Kebede. That was a temporary move, because at around 40km, he was gapped, and the tiny Ethiopian, who many consider unlucky to have missed out on the Olympic Games in London, showed his major marathon credentials, to move away and claim an ultimately comfortable victory. Behind him, as mentioned, PBs for Lilesa, Regussa (a super fast debut, though not quite as quick as Kimetto last week in Berlin), Kitwara and Korir. The USA’s Dathan Ritzenhein also ran a PB, finishing in 2:07:47 for ninth place. Below is the race, as it happened. You’ll see 5km splits, overall times and the odd comment. It also shows how the early pace was slow, perhaps because it was a little too cold (4C or 40F at the start), and that they were never ahead of Mosop’s course record until 40km. Below the splits are my comments as the race unfolded. New York remains as the final marathon of the Majors, though Frankfurt may yet have a say in the ranking lists. Join us for those in coming weeks! The women’s race produced a spectacular finish, as Atsede Baysa of Ethiopia raced side by side against Rita Jeptoo of Kenya, ultimately winning by less than a second. Baysa’s winning time of 2:22:04 is not spectacular, but the finish was. Baysa has run three marathons this year, and according to the best commentator of the day, Tim Hutchings, has made a habit of running three or four marathons a year. She has won Paris twice, and had a PB of 2:22:04 coming in (she equalled it today), but her recent form didn’t point to her as the likely winner. The pace was consistent throughout – 10km in 34min projected a 2:23:28, then halfway was reached in 1:11:15 (2:22:30 projected), and so it remained pretty steady, a race of attrition as early leaders fell away. There was no decisive move, though the 10km from 30km to 40km were covered in 33:30, the fastest of the race. That was when the east Africans made their presence felt, and the Russians who had led early were relegated to outside the top 3. First among them would be Liliya Shobukhova, who was bidding for her fourth straight Chicago victory, but ultimately came up short in fourth place, 55 seconds down on the winner. The other spectacular thing about the women’s race is just how bad the commentary was from out on course. Joan Benoit Samuelson was on the route, and she first crowned Maria Konovalova of Russia as the champion after only 10km. Then by halfway, she declared the Shobukhova had the race under control. By 25km, Lucy Kabuu was your winner, and of course by 40km, it was Jeptoo. Her voice tremored with excitement as she urged the runners to “run” and “use your arms”, and made the race difficult to watch with the sound on. It was as though she’s never watched a marathon before, let alone won some really big ones. The pace may have slowed (14:40 for the last 5km), but it’s still much faster than Mosop last year at the same stage, and the result is that having been behind course record pace all the way, Kebede is now well under it – his 1:58:02 at 40km puts him 31s ahead of Mosop at the same stage last year. Kebede has also dropped Lilesa, and running from the front, is on the way to the Chicago title, in a course record, and possibly the fastest time in the world this year, though that may be just out of reach. It’s down to two – Kebede and Lilesa responded to Regassa’s surge, and it was enough to drop Kitwara, and so now Kebede finds himself in familiar territory – driving the pace in the final 5km of the Chicago Marathon. This time, there is no Sammy Wanjiru, but rather countryman Feyisa Lilesa. The last 5km in 14:19, and so now it really is spectacular! The last 10km have been covered in 28:48. That’s very aggressive, and it explains why the lead group has been thinned to only four. Three Ethiopians vs one Kenyan, and that Kenyan in Sammy Kitwara. Regassa surged just after 35km, so the race is now really on. The race has come nicely to a boil now – Kebede started it at 28km, and the damage is now becoming clearly. The group was eleven when Kebede went to the front, it thinned to 7 or 8 at 30km, and now, at about 33km, it’s down to five. And now it’s four, as last year’s second-placer Wesley Korir (also Boston champ this year) is just beginning to drop off. Sammy Kitwara is there, he of the sub-59 min half marathon and that’s a big dangerman for the Kebede and the Ethiopians – any sub 59 min guy is always an exciting proposition in the marathon. Feyisa Lilesa is still there, and so is Tilahun Regassa. Tony Reavis thinks it is four Ethiopians, but of course Kitwara makes it one Kenyan vs three Ethiopians. Speaking of bad commentary, Joan Benoit Samuelson is doing an appalling job on the women’s race. After about 8km, she basically awarded the victory to Konovalova, then by 15km it was Shobhukova, and now, at 30km, Lucy Kabuu is your winner. You’d think she’s never run (or seen) a marathon before…from the uncontrolled excitement in her voice, she’s clearly never been trained as a commentator either. Tsegay Kebede, he of the epic duel of 2012 with Sammy Wanjiru, has gone to the front at about 28km, and is now either the undesignated pacemaker or is feeling so strong that he’s willing to front run for the final 14km. It definitely got more aggressive – not decisively, because only two men have dropped off as a result, but the lead group (which I make ten large) is definitely being stretched and the ‘casualties’ will become clearer within the next ten minutes. Kebede was of course the major omission from Ethiopia’s Olympic team, and perhaps has a point to prove. By 30km, the aggression has produced the expected increase in pace, but again, nothing too spectacular – 14:29 for the last 5km, so that’s very fast. But compare the 14:18 that Mutai ran when he surged at 30km in Berlin last week, and you see why there are still eight or nine in that group. The pace has slowed a little – 14:54 for the last 5km. Kebede is showing strongly at the front, but all the major players, Kenyan and Ethiopian, are still there. 1:02:53 through the half-marathon, and so they are on schedule for a sub-2:06, and it may well get considerably faster. They are ahead of course record schedule, for what that is worth, because the big changes will come after 30km. Weather update – light winds, and a temperature of 40F (4C). The commentators and weather lady say it is ideal for marathon running. It’s actually too cold, especially if you are running at 20km/h. That explains why the pace is fast without being sensational. At 20km, it’s 59:40. 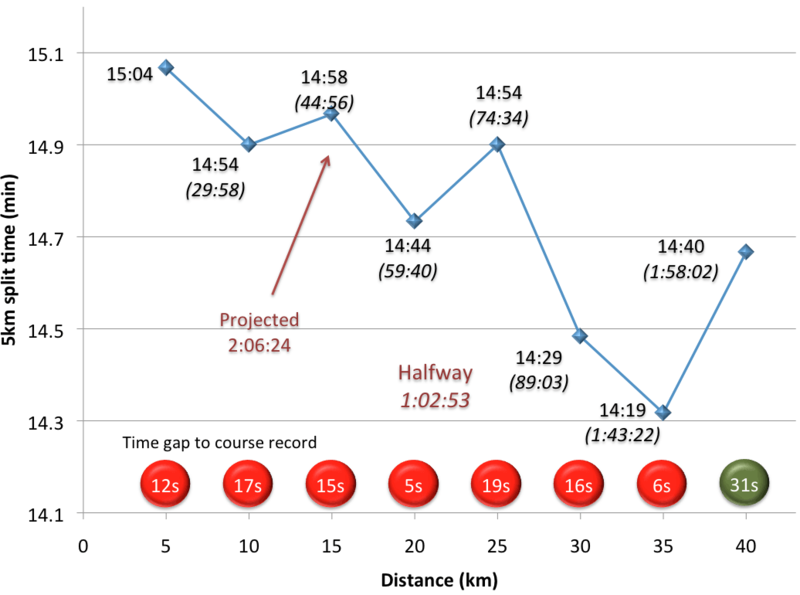 The pace has been remarkably consistent, with very little variation, but now it has really been ramped up – that was 14:44 for the last 5km, and it brings them to within 5 seconds of Mosop’s time last year. What will determine whether they can get back to the course record is how the attacks come and whether they are too aggressive. As Geoffrey Mutai showed in Berlin, too big a surge at around 30km can become costly to overall time, even though it may win the tactical race. Should be intriguing once we get to 30km, because at this pace, there’ll be ten left once the pacemakers drop off. Two mile splits from the interval were 4:45 and 4:50, so the pace remains at around 3min/km. The last 5km were covered in 14:58, so still nothing spectacular, but the pace has been remarkably constant, as the graph shows. A group of 15 in the lead. The 10km mark has just been reached – 29:58, so a small increase in speed. The last 5km were covered in 14:54, and it brings them onto a 2:06:27 pace. 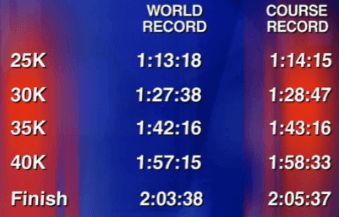 At this stage, they’re 41s behind the time that Makau ran on route to his record in Berlin, but they are closer to Mosop’s 2012 course record – the gap there is 17 seconds. The first mile was done outside 5 miles, which was very slow. It then sped up with a 4:42 second mile, but the time to 5km was slow – 15:04, which projecs a 2:07:09. I think it’s safe to say that the pace will ramp up. The conditions were thought to be ideal, but it’s now being reported that it may be too cold. 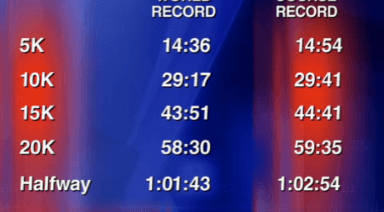 For comparison’s sake, the image belows shows the 5km split times for the world record (left column) and the current Chicago Marathon course record (Mosop from last year).